Primitive long piled rugs in Turkey and Iran include Geve, Siirt, Tulu and Gabbeh. These are broad terms with many regional derivatives in use. For example Hopan is a term used to describe a textile that is neither a carpet nor a Geve and is called a “Kilig” in Usak-Esme-Ahmetler village. 1 Categorising every colloquial variation would be an arduous task. In South Eastern Turkey bordering Iran Kurdish weavers produce a long rug called Badani, the pile is long unspun sheep’s wool. A few years ago I came across a small rug resembling the long Kurdish Badani’s. The small rug has long unspun sheep’s wool and up to thirty weft shots between rows of knots and could have been used with either side up. The ends are completed with slit woven tapestry. The rug was exported from Iran to Australia and at the time labeled “Bakhtiari”. On page 86 of Oriental Carpets From the Tents, Cottages, and Workshops of Asia 5 Jon Thompson presents an image by photographer Nasrollah Kasraian. Two of Kasraian’s images shot in the early eighties, of Kurdish nomad women near Maku in North West Persia are frequently referenced in print and online. An almost identical small rug can be seen in the background of Kasraian’s images. The small Kurdish rug was probably woven in the 1970’s . Kurdish Badani’s are woven in South Eastern Turkey and Maku is just across the border in Iran. Görgünay 6 illustrates an example from Bitlis just north of Siirt. Our rug is only 147 cm x 84 cm (4’ 10” x 2’ 9”) unlike the long Kurdish rugs from Turkey. John Wertime 7 discussed the probability that Bakhtiyari nomads in the Zagros mountains did not weave heavy piled rugs because of the difficulties in making the long journey through the Zagros mountains, from yaylaq to qishlaq. 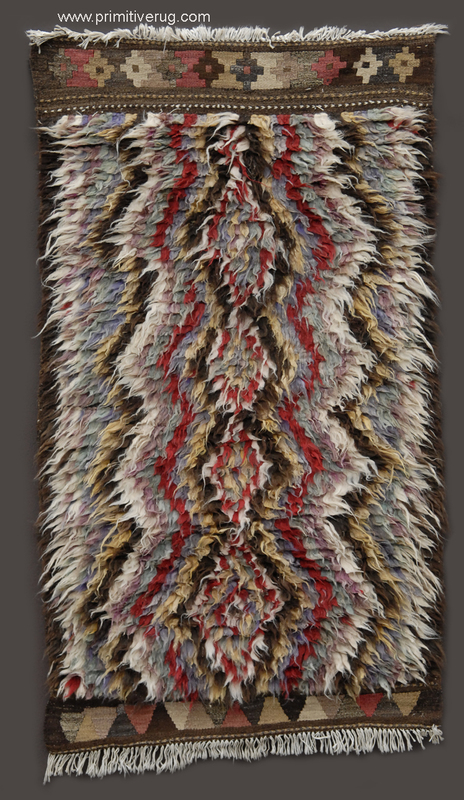 Wertime also mentions that the Bakhtiyari's wove long piled Gabbeh like rugs. Hamid Sadeghi and Karin Hawkes 8 in Gabbehs: Stammesteppiche der Bergnomaden am Zagrosdescribe “blanket-like” rugs with “multiple groundwefts” the same as our rug. If you watched the documentary in the previous post you will understand why large Persian carpets would be impractical to carry through the Zagros mountains. In the second video if you look carefully you will see a small rug with long unspun pile (when the donkeys and horses are being unloaded). It becomes obvious that small rugs of this size fit neatly over the “saddle” covers on the donkeys. 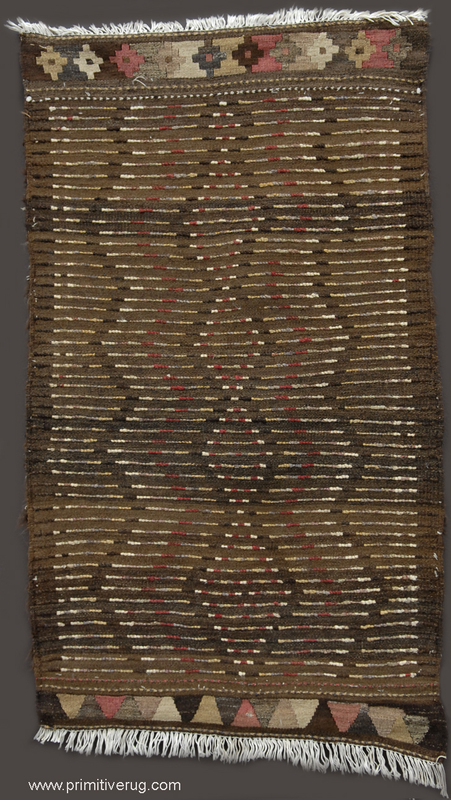 These small rugs were probably produced by both the Kurdish nomads in the Maku area and further south by the Bakhtiyari's traversing the Zagros mountains. 2 Prof. Dr. Neriman Görgünay. loc. cit.